In the Dolomites, everywhere there is colour. From the soft pink stone and the brilliant blues of the 297 glacial lakes that are such a feature of the region, to the bright saffron, blue gentians, alpine edelweiss and wild lilies that jostle vividly in lush summer meadows. And the evening light that turns towering rock walls into a glowing panoply of pinks is nothing short of breathtaking. This is outstanding walking territory, made even more enjoyable by the legendary hospitality of the mountain people. 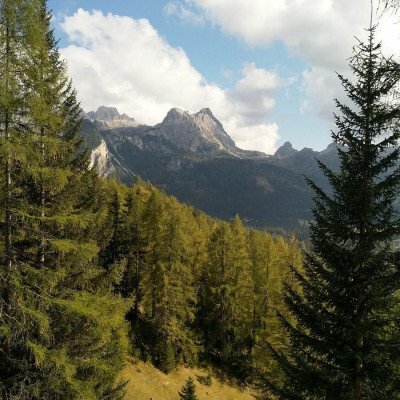 The Dolomites are just not like any other mountains. Hidden away in the north-east corner of Italy they still remain a real haven from commercial tourism and provide a dramatic ever changing landscape ideal for exploring on a walking holiday. 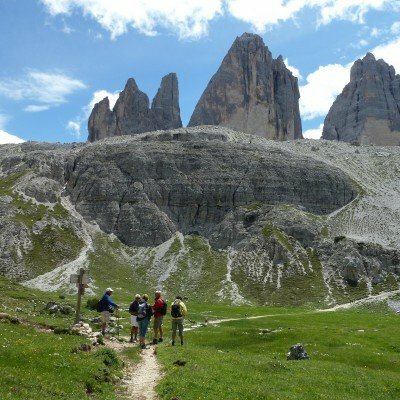 Sixty million years of erosion have sculpted awesome jagged spires, hanging glaciers, tortured columns and 'moonscape' plateaux; a spectacular backdrop to the open pastures, staggering array of wild flowers and gently undulating woods where you're walking.